Very often during the fabrication of parts on a mini-lathe or micro mill the operator us required to make a part which is a particular size. For example, I might want to make a 20mm wide axle to fit into a 20mm wide hole. Simply using a ruler to gauge the exact size of a metal part is not going to work very well. Specialised tools must be used so that the size of the part can be measured down to very small amounts. The usual "smallest" measure we work with is a thousandth of an inch - commonly called a "thou". One turns a part in your lathe to remove a "few thou" off the diameter - a thou is a very small amount, and is also roughly (but by no means exactly) about 0.025mm. Metalworks also talk about "tenths". A "tenth" usually means one tenth of one thousandth of one inch. Or one ten thousandth of an inch. The pressure must be applied by hand. Too much pressure or too little pressure will result in inaccurate measurements. A vernier caliper is useful for getting close to the required sized, because of the inherent speed and easy of use and reading. The micrometer is a far more accurate instrument. 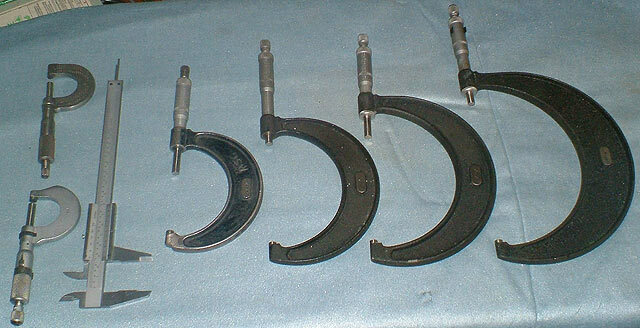 The traditional shaped outside diameter micrometer is the most common model. Most micrometers have a measuring range of about 1 inch, or 25mm. Therefore a set of micrometers is required to cover the same range possible with one vernier. The micrometer has a screw at one end that tightens the jaws. The screw features very low (virtually zero) backlash and a ratchet. The ratchet is a key feature of the micrometer, and allows a consistant amount of pressure to be applied when making a measurement. You tighten the end of the screw until the ratchet clicks, and then make the reading off the scale. Some higher quality micrometers will also have a vernier scale in addition to their standard scales for reading off ten thousandths of an inch. I strongly suggest you never pay more than �� for an single vernier or micrometer. On ebay it is possible to pick up second hand micrometers for very little - there is a lot of choice. Make sure you choose items which will have their setting bars. A setting bar is a piece of metal of a fixed length that can be used to check the calibration of the micrometer. A case is also useful to have. Expect to pay of few quid extra for these nice to haves. I often get asked how to read an imperial micrometer. It is fairly straightfoward... but you must think in a sort of decimal way. None of the 32nds and 16th nonsense. An imperial micrometer measures thousandths of a inch. It measures the number of thousandths of an inch between the minimum and maximum positions on a micrometer. When the micrometer is screwed all the way in, it shows 0. There are two sets of figures. One around the screw (ie the rotating bit), and one along the scale. The fixed numbers along the scale run from 0 to 9. Each of those is 0.1 inches. Or 100 thousandths. Now, it takes four rotations of the screw to move between each of those divisions. This is why it is marked out with 4 divisions. Each of those divisions is 25 thousandths of an inch. 0.025. There are four lots of 0.025 in 0.1. Mind you, it is not always clear which of those divisions you are "on". The rotating barrel scale is divided into 25 divisions. (Getting the idea now?). Unscrew the imperial micrometer so it fits over the part. Screw it back in until reaches one of the 10 numbered divisions on the fixed scale (ie 1,2,3,4,5, etc) and doesn't fit any more. Line it up with the rotating scale on 0 against the numbered divisions. Then open the micrometer until it fits, but take care to count the number of rotations. Let us say it requires 2 and a bit unscrewing rotations. This helps you decide which of the 4 "25/1000" divisions of the longitudinal scale you are on. Screw it down onto the part until the ratchet clicks. To calculate the size, take the marked number of divisons on the large fixed scale (eg 3) and that is 300/1000ths. Then add on the number of minor divisions (eg 2) = 2X25/1000ths. Finally add on the number on the rotating scale (say 18). The total is 368/1000ths inch. Of course, if the micrometer is a 3"-4" micrometer, then the total size is 3.368 inches. Below you can see my collection. I have a single 6 inch vernier caliper. I don't like the digital ones - the batterys go flat, and i don't like the ones with dials as they are too clumsy and the dial always gets in the way. I also have enough micrometers to get me from 0 to 6 inches. I've a selection of imperial and metric micrometers, so often have to convert between different units.